To get your weekend kick-started, here’s a live show preview featuring California-based rapper Lyrics Born and live remixing trio Keys N Krates at Abbey Pub, plus the usual plethora of Friday download gems from Wolfgang’s Vault celebrating Bonnie Raitt, The Newport Jazz Festival, The Grateful Dead and more. 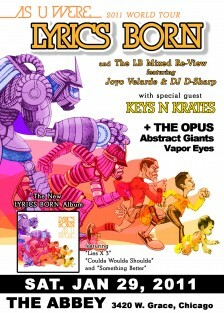 There are good times brewing at the Abbey Pub tomorrow night as Lyrics Born headlines with special guests Keys N Krates. I first saw Lyrics Born live at Lollapalooza 2006 (iTunes) and was blown away at his deft blend of soul crooning, fresh flow, righteous rhymes and funky beats. Basically, the dude knows how to rock a crowd and his most recent release As U Were (iTunes) was on my list of favorite albums of 2010 and has been on regular rotation in all my music listening devices ever since. But before Lyrics Born does his thing, Canadian trio Keys N Krates, will be rocking the stage with their unique blend of live remixing and hip hop. And considering the previous experimental fun we’ve had there before, the Abbey will certainly be a place teaming with the community of groove. Like they do every week, Wolfgang’s Vault has a rocking list of featured artists that you can explore from the past and present in live music downloads. And this week they’re featuring Newport Jazz Festival, Grateful Dead Merch and Bonnie Raitt a live show download perfect for continuing our exploration involving the impact of Raitt’s emotive live show on the community of concert fans. Go check it all out in the the Public Playlist, Concert Vault and $4 daily deals on full concert downloads . If you’re wondering, once you sign up for WGV the downloads can be transferred to your iPod, burned to a CD or whatever you wish. And all of the downloads are available in both high-quality 256k mp3 and lossless CD-quality FLAC format. And if you’re looking to go mobile, go check out the WGV iPhone app. Be sure to get the details about the new personalized and Facebook friendly features on the Wolfgang’s Vault Blog and see what else they’re up this week. There’s lots of great stuff you don’t want to miss! For more info on why we’re big fans of Wolfgang’s Vault and why we think it’s an awesome site for concert fans, check out my review of WGV and this article about Live Fix and WGV being featured in the Wall Street Journal. In case you’ve missed them, go check out the other free downloads from Grape Juice Records, Girl Talk, Keys N Krates, Pixies and others that we’ve featured previously on Live Fix. Want Your Live Download Featured on Live Fix? We’re always looking for great new music and cool live downloads to share with the crowd, so if your band has a live mp3 that you’d like to post on Live Fix, please send it to chris@christophercatania.com. That’s it! We hope you have a great weekend of shows. Let us know how it goes and be sure to share your favorite concert experiences in the comments below. Stay tuned for more next week as we explore V-Moda headphones, give away a some cool prizes and embark on more exciting adventures in live music!